Jesus grew up in the city of Nazareth. As a boy, Jesus learned many things and was strong in spirit. When Jesus was 12 years old, He went with Joseph and Mary to a celebration in Jerusalem. After the celebration, Mary and Joseph started walking home. They thought Jesus was walking with His friends. When Mary and Joseph started looking for Jesus, they could not find Him. They went back to Jerusalem to look for Jesus. They looked for three days. 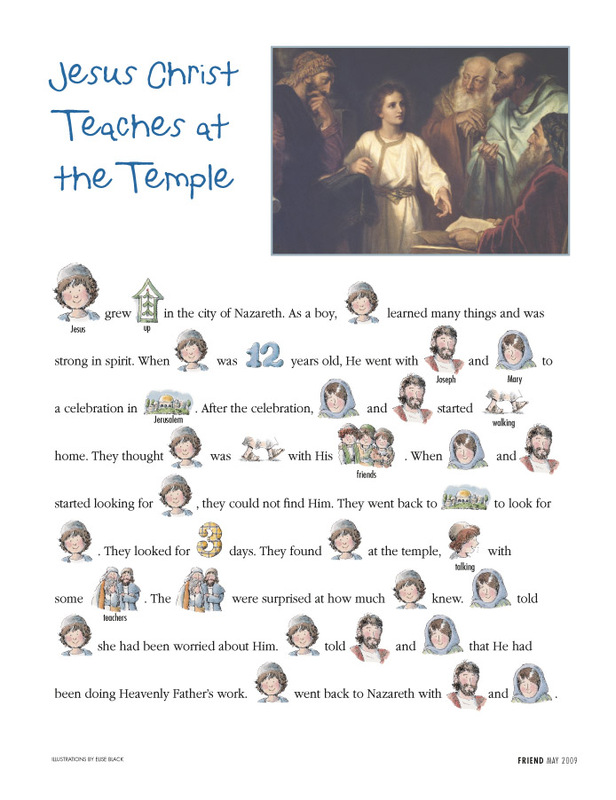 They found Jesus at the temple, talking with some teachers. The teachers were surprised at how much Jesus knew. Mary told Jesus she had been worried about Him. Jesus told Joseph and Mary that He had been doing Heavenly Father’s work. Jesus went back to Nazareth with Joseph and Mary.